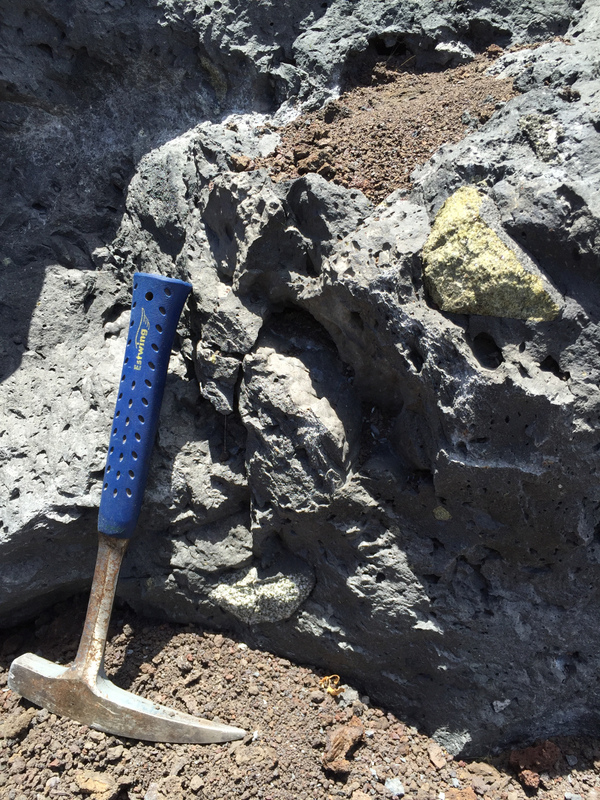 The 1800-1801 alkalic lava flows from Hualalai are famous for their abundant xenoliths. 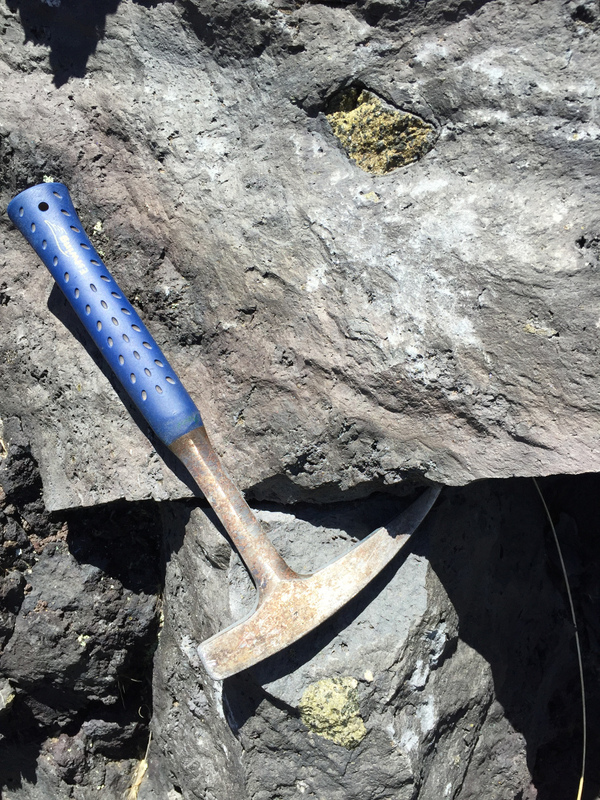 Peridotite, pyroxenite, and gabbro xenoliths are common in the flows. 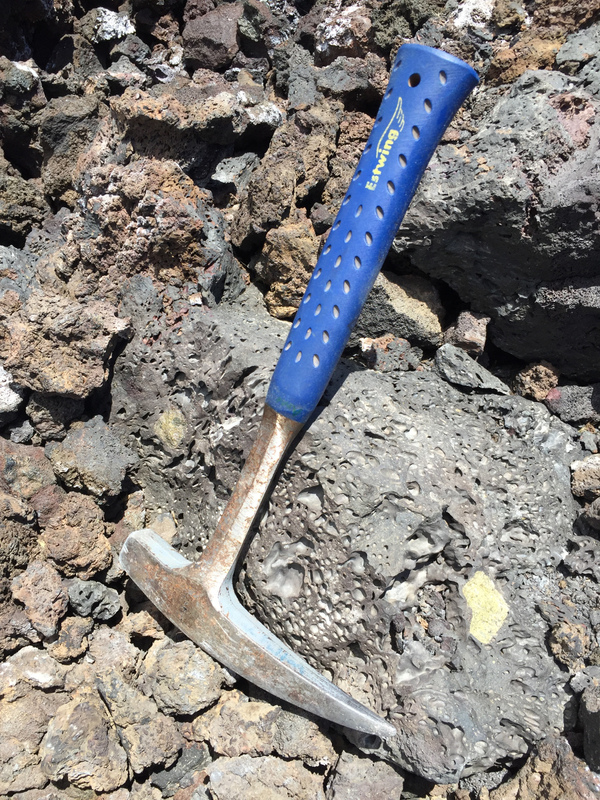 While some of the xenoliths may represent the mantle beneath Hawai'i, the majority are interpreted as ultramafic/mafic cumulates (accumulations of olivine, pyroxene, and plagioclase that crystalized from pre-eruption magmas; see the last two references below). Highway 190 cuts through these flows and provides easy access to the xenoliths. The first set of coordinates above is for a good parking spot on the north side of the highway. 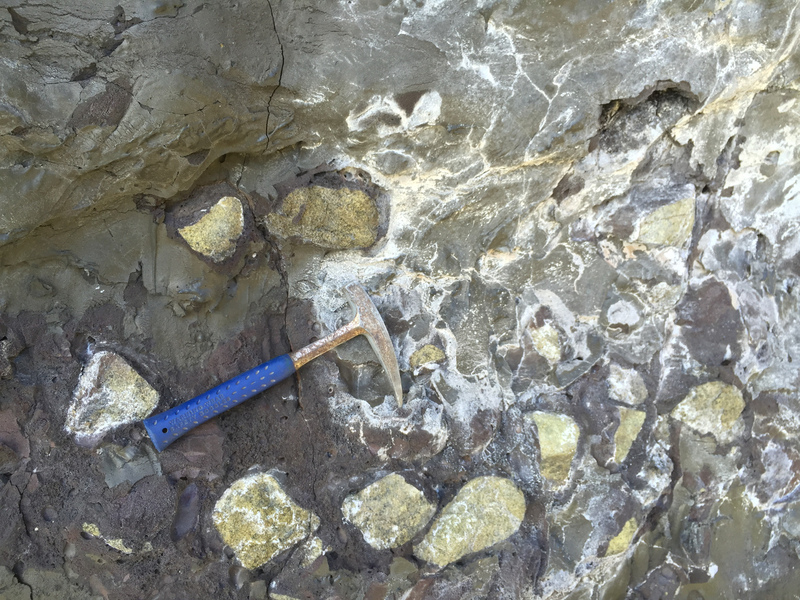 We found the best xenoliths in the roadcuts on the south side of the highway just to the west of this parking area. (Exercise extreme caution, as the outcrops are right along the side of a highway with fast-moving traffic.) 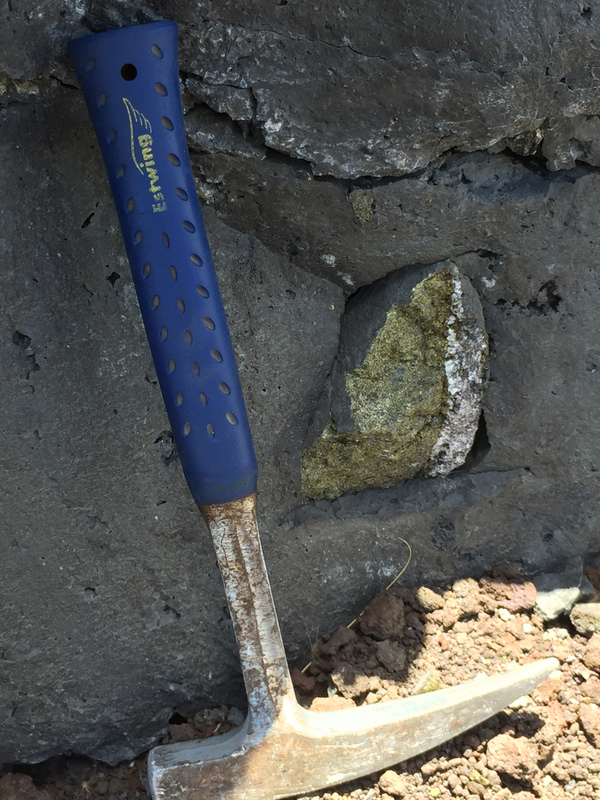 The largest xenoliths appear to be within the dense flow core, although the a'a rubble on both sides of the highway also contains excellent xenolith nodules. The first reference below (Sandatlas) gives coordinates for a location less than half a mile to the east of this spot. We visited those coordinates, but we didn't find as many xenoliths there as we did at this first location. The second set of coordinates gives the location of an awesome collapsed pyroduct. 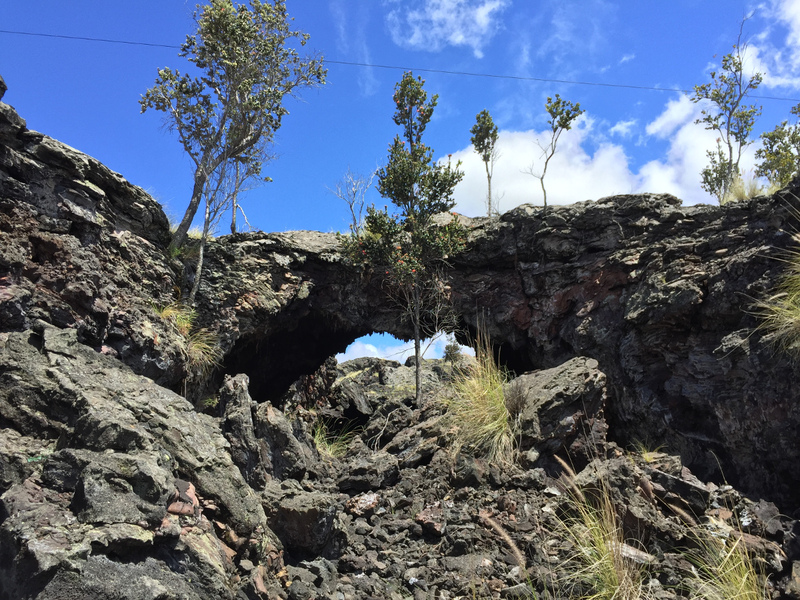 (Pyroduct is a better scientific term for lava tube.) If you walk up this channel a bit, you'll be able to see really awesome lava spatter textures. 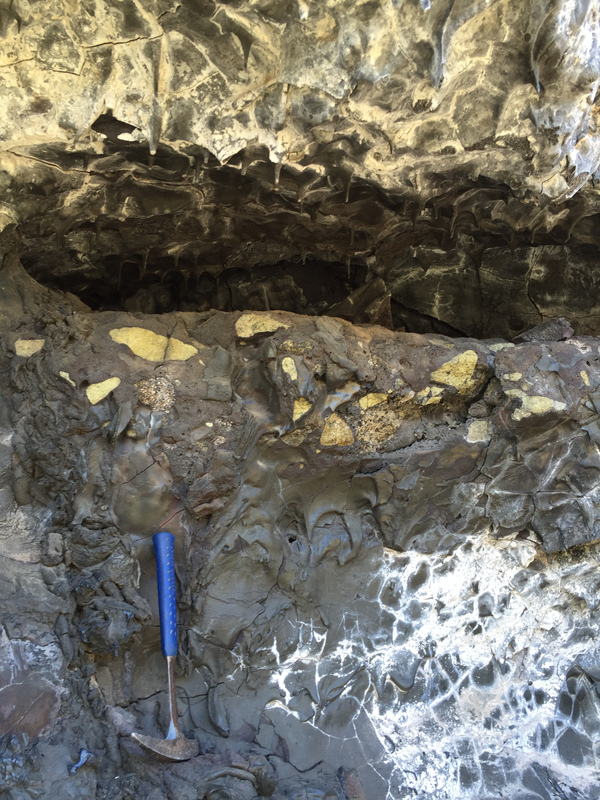 Also, about 100 feet or so up this channel, you can see spectacular head-sized xenoliths embedded within the sides of this relict pyroduct. Definitely worth checking out. These nodules are well cemented in the basalt, so trying to collect here won't be worthwhile. It's far better just to appreciate the pure awesomeness. 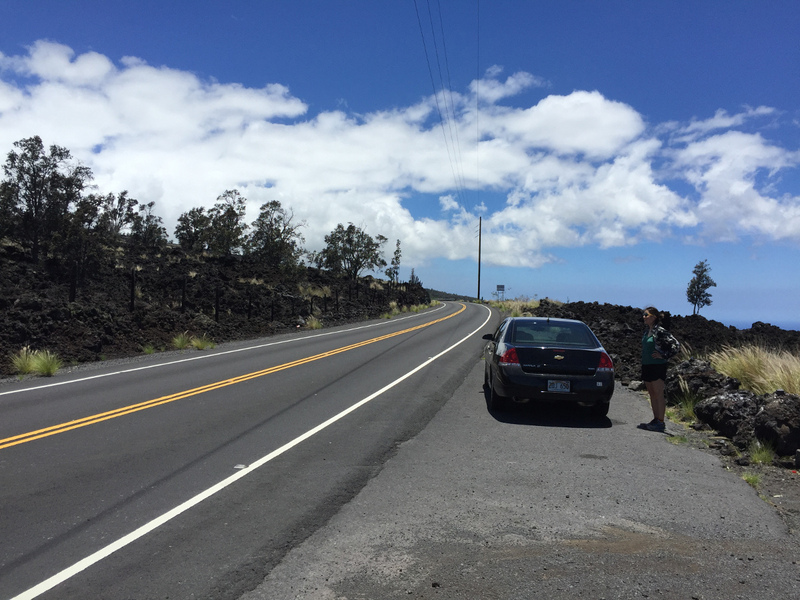 The third set of coordinates above is for a nice lava arch on the south side of Highway 190. This arch is the last remaining portion of the roof of a now mostly collapsed pyroduct. (The continuation of this pyroduct can be seen on the north side of the highway.) There is a scenic pullout on the north side of the highway just to the east of this location. The channel is a little trashed, but the lava textures are again really awesome. There are some smaller tubes and more interesting textures about 200 feet up this channel. 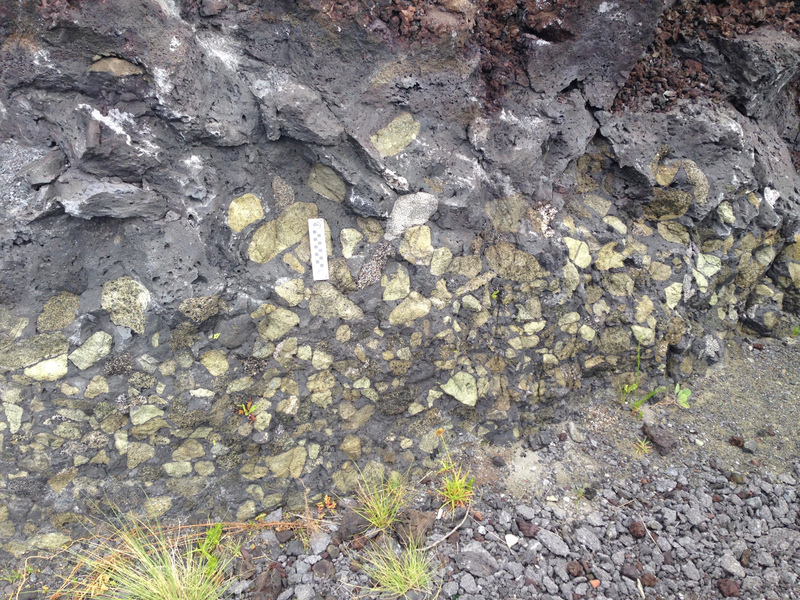 The fourth set of coordinates is for an awesome xenolith nodule bed in the lava flow right along the side of the road. Please don't whack at this outcrop; just marvel at the pure awesomeness and preserve it for others to enjoy! 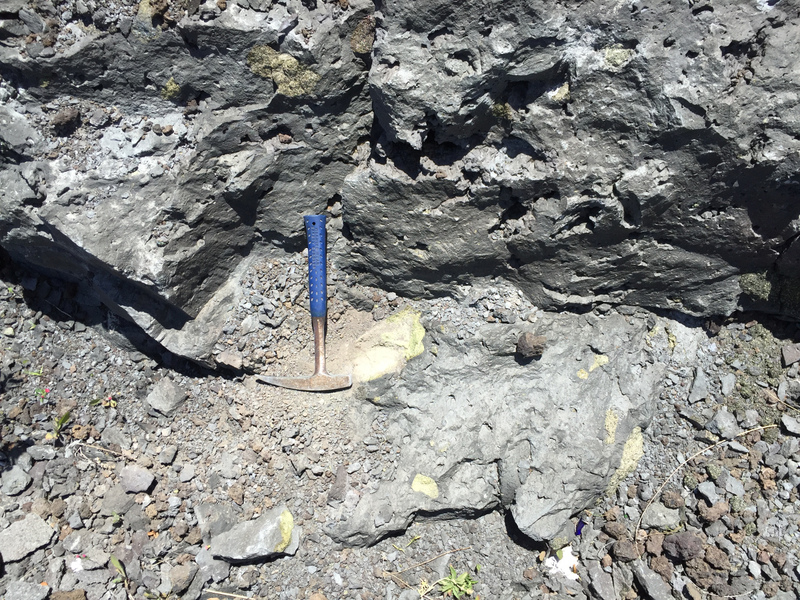 Emplacement of xenolith nodules in the Kaupulehu lava flow, Hualalai Volcano, Hawaii, J.E. Guest et al., Bulletin of Volcanology, 1995. 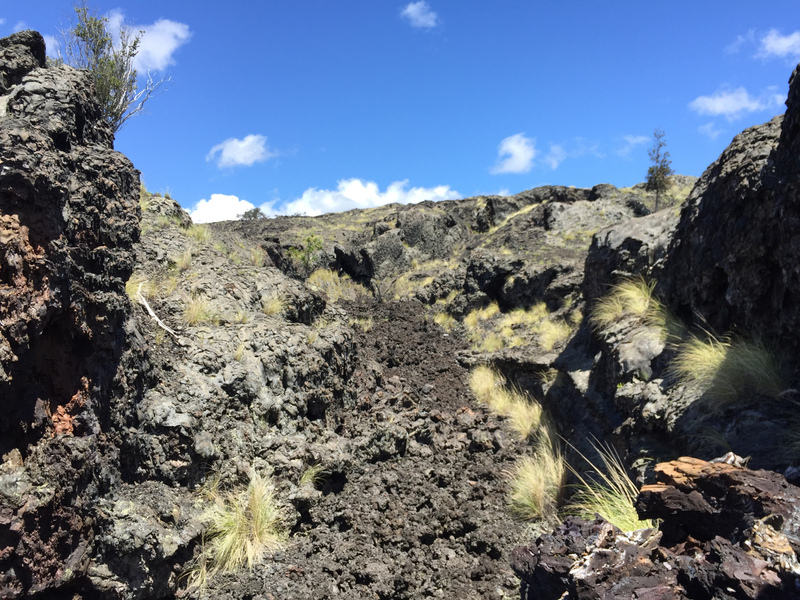 Petrogenesis of Ultramafic Xenoliths from the 1800 Kaupulehu Flow, Hualalai Volcano, Hawaii, C.-H. Chen et al., Journal of Petrology, 1992. 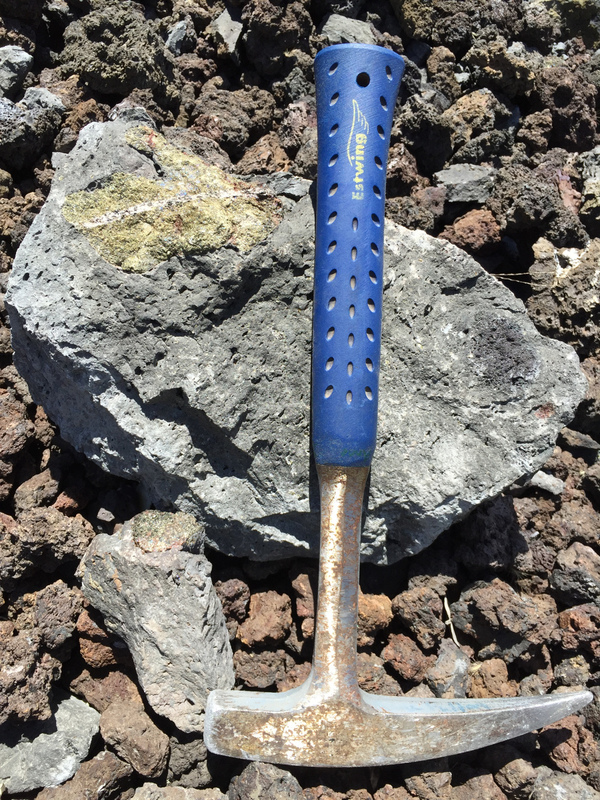 Origin of ultramafic xenoliths containing exsolved pyroxenes from Hualalai Volcano, Hawaii, W.A. Bohrson & D.A. Clague, Contributions to Mineralogy and Petrology, 1988.